January 30, 2018 – Plants grow just about everywhere on Earth, and are able to adapt to extreme conditions ranging from drought to disease. Spaceflight, however, exposes plants to stresses not found anywhere on their home planet. Growing plants aboard the International Space Station provides a unique opportunity to study how plants adapt to microgravity, and a team of researchers recently published results in “PLOS One” concerning plant adaptations at the genetic level. Understanding how spaceflight affects plants is critical for future efforts to cultivate plants during spaceflight. Optimizing plant growth, both on Earth and in space is critical because plants may serve as a food source for long term missions, or even be used to supplement life support missions. “There are many environments on Earth that are becoming marginal through pollution, rising temperatures, encroaching drought, etc. and learning how plants respond to novel environments – any novel environment – can help us prepare for breeding crops to thrive in places they never had to before,” said primary investigator Anna-Lisa Paul . The Characterizing Arabidopsis Root Attractions (CARA) investigation sought to get to the root of this issue by examining the genetic basis of plant responses, and dug up intriguing possibilities for further studies. In 2014, NASA astronaut Steve Swanson grew Arabidopsis thaliana, or thale cress, seeds aboard the station, as did investigators on the ground. The seeds represented three genotypes: Wassilewskija (WS), Columbia-0 (Col-0) and Columbia-0 PhyD (phyD). The last strain, phyD, differed from Columbia-0 only by a mutation in the phyD gene. Half the seeds were grown in ambient light conditions, while the other half were grown in darkness. Researchers later extracted RNA from the root tips of these plants in order to quantify changes in gene expression due to spaceflight. While DNA can tell you if a gene is present or absent in an organism, RNA will measure it’s transcription level telling the researchers if a gene is experiencing changes in expression level during space flight. In terms of plant health and productivity, the three genotypes responded similarly to spaceflight. Only ground-based WS plants grown in light showed a significant difference in root length. Sequencing the plants’ RNA revealed a different story. All three genotypes had altered gene expression, but differed in the number and type of genes affected. For instance, phyD had fewer changes in gene expression than Col-0, despite the genotypes differing only by a single gene. The number and type of genes with changed expression also varied depending on light conditions. 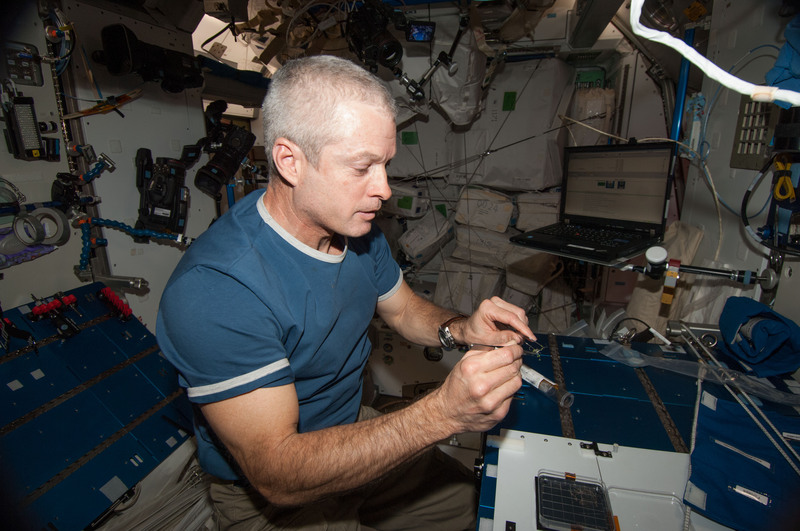 Spaceflight altered gene expression in the plants more frequently in ambient light conditions than in dark conditions. Meanwhile, many of the genes that were expressed in plants grown in the light showed no change in the plants grown in the dark, and vice-versa. Some types of genes were more frequently altered by spaceflight, such as genes governing cell walls and intercellular communication. Others were specific to genotypes or lighting conditions. The research team concluded that plant response to spaceflight might best be characterized by categories of genes rather than specific genes. Plants have not had the opportunity to evolve a response to spaceflight, so there is no response as there are for stresses on Earth. The difference between the reactions of Col-0 and phyD suggests that unwanted gene expression during spaceflight could be suppressed by alternating one or more genes. The phyD genotype exhibited fewer expressions than the Col-0 genotype despite the two genotypes differing by a single mutation. This suggests that with further research, it could be possible to develop plant strains with minimally-altered gene expression during spaceflight. It’s possible that a more efficient response to spaceflight would optimize plant health and use. If so, investigating alternate genotype reactions to spaceflight could facilitate future attempts to grow plants in microgravity environments. Follow @ISS_Research for up-to-date information on this investigation’s follow-up, Characterizing Arabidopsis Root Attractions-2 (CARA-2). This National Lab sponsored investigation is managed by the Center for the Advancement of Science in Space and funded by the Space life and Physical Science Research and Application Division (SLPSRA).